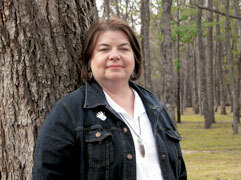 Oklahoma clay artist Anita Fields says she always has more questions about life than answers. "By making art, I try to clarify intuitive moments of time, truth, and place," says the artist. "My creative endeavors are how I acknowledge what I know to be true. It is the language I employ to define my place within the world." 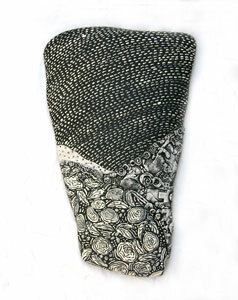 Fields' chosen medium of clay is a product of the earth, which plays an integral role in her inspiration. "Many ideas are informed by memory and recalling instances of certainty, sounds heard during the quiet arrival of a new day, and moving over the earth I know my ancestors moved on before me," says Fields. "Clay is soft, malleable, and easily articulated into symbolic elements alluding to the presence of nature and human emotion. With each handful of moist earth, I am given the opportunity to express myself in a manner that reflects what it is that has been left for me. It is a way to look at the world and a way to think as an Osage woman." Fields goes on to explain, "Constructed, pressed, and arranged clay forms serve as metaphors for personal and cultural ideology. On small bits of torn clay, I create textures and patterns by impressing personal objects that are meaningful and important to me, the fragments of clay are then collaged onto earthen shapes. The objects used for impressions are varied and can be as simple as twigs, stones, shells, or materials found during a walk or travel to a new landscape. They can be a favorite pair of earrings, a piece of textured cloth, ribbon-work patterns from our traditional clothing, or imprints from a beaded purse." Fields was born in Hominy, Oklahoma, and is a member of the Osage Nation. She studied at the Institute of American Indian Arts in Santa Fe, New Mexico, and completed her Bachelor of Fine Arts at Oklahoma State University in Stillwater. 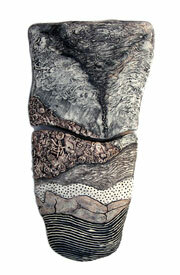 As a professional artist, Fields exhibits her work nationally and internationally. Recent works were included in exhibits at the Heard Museum in Phoenix, Arizona; the National Museum of the American Indian at the Smithsonian Institution in New York, New York; the Gilcrease Museum in Tulsa, Oklahoma; the Peabody Essex Museum in Salem, Massachusetts; and the National Museum of Women in the Arts in Washington, D.C.
Fields presents workshops, lectures, and residencies around the country, working with a variety of ages and audiences. In 2008, Fields was one of the three artists selected to participate in Eiteljorg Museum of American Indians and Western Art's Reaching Out with Artists-in-Residence (RARE) program. Fields was also one of 47 Native American delegates funded by the Kellogg Foundation and the Institute of American Indian Arts to travel to South Africa during the summer of 2007 for The Answers Lie Within, a cultural and economic exchange between indigenous artists and educators. Fields' art has been published in Southwest Art, American Craft, Ms. Magazine, American Style, and Contemporary Ceramics, in addition to Native Peoples, Women Artists of the American West, and the Encyclopedia of North American Indian. 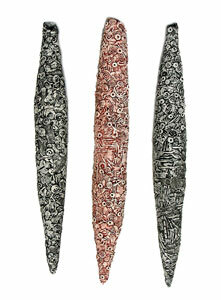 Her artwork can be found in several private and museum collections. She currently lives and works in Stillwater, Oklahoma. The Capitol is home to four art galleries, exhibiting works of current and past Oklahoma artists. Located on the second floor of the Capitol, adjacent to the Governor's Blue Room, the Governor's Gallery features paintings and mixed media works by current Oklahoma artists. Exhibitions rotate approximately every 60 days. Hours: Weekdays 8:30 a.m. to 5 p.m. The Governor's Gallery is curated by the Oklahoma Arts Council. For more information contact our Curator of Education and Capitol Galleries.